Reliably Boolean Add or Subtract your mesh files to have them perfectly prepared for 3D Printing. Whether directly embedded in Jewelry CAD Dream or as standalone software, this is a high end mesh tool for an excellent value. Many times CAD engines experience difficulty when trying to Boolean Add/Subtract parts for whatever the underlying reason may be. 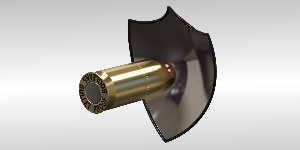 Hence the need for a specialty product; ‘Bullet Proof Booleans’, embedded within Jewelry CAD Dream, automates Boolean Additions and Subtraction along with making your files ready for 3D printing. Here is a common CAD scenario. You spend time building a magnificent piece that appears to be 'closed' in your software. But when you try to print it, the file is rejected (or prints badly). This can happen for any number of reasons and often leads to a lot of wasted time trying to resolve the issue. 'Bullet Proof Booleans' ensures this NEVER happens. With this tool you can automatically fix your STL file (literally with the click of a button) and know definitively that it is a clean, watertight model ready for the printer. Bullet Proof Booleans is based on the LimitState:FIX engine. This automatically identifies and repairs defects in STL files. And it does it fast. 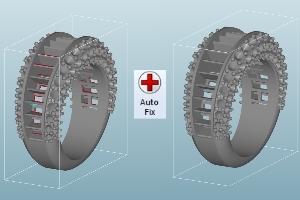 Using the groundbreaking Polygonica technology, the most robust tool for repairing meshes, Bullet Proof Booleans makes Jewelry CAD modeler's lives' much, much easier.